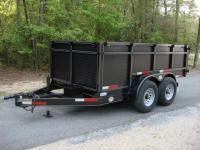 6ft X 10ft Dump Trailer, Power Up & Down Lift, 24" Steel Sides w/Stake Pockets, 3,500lb Brake Axles, Barn Doors! Hawke 6ft X 12ft Dump Trailer 5 Ton, With Tarp & Spare Tire Holder! 5 Ton 6ft X 12ft Dump Trailer, Hawke Brand is Heavy Duty! Power Up & Power Down! Macon Custom Trailers & Golf Carts has been visited 9,651,149 times.